Content Marketing Institute’s latest research shows technology marketers are seeing more success with content marketing. According to the research, 31% of tech marketers reported high levels of content marketing success - up 7 percentage points from last year. However, 69% of tech marketers are still struggling with their content marketing approach. 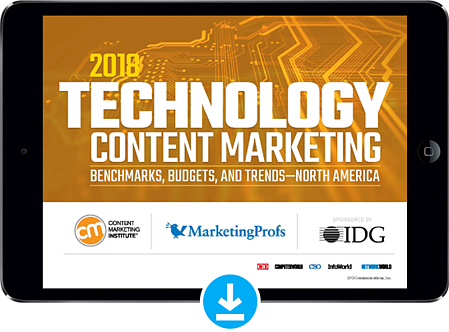 Download your copy of Technology Content Marketing 2018: Benchmarks, Budgets, and Trends, by filling out the form.